Remember those Modern Warfare levels that really surprised? The ones with a twist that didn’t respect the nascent rules of first-person narrative? Yeah, this isn’t one of those. 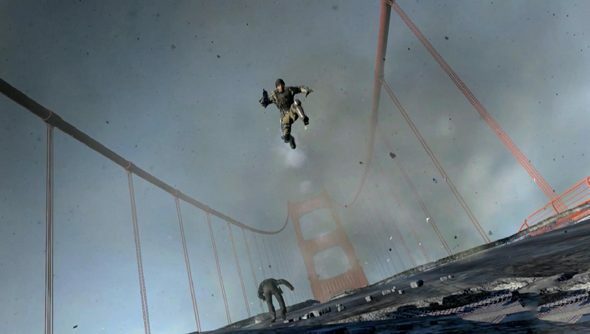 The Call of Duty: Advanced Warfare demo Sledgehammer Games showed off at Microsoft’s GamesCom show was named ‘Collapse’ and set on the edge of San Francisco. Can you guess what collapsed? I wonder: does the cockney accent come in special forces training, or is it a prerequisite? Brief and violently-concluded vehicle sections have been in vogue since Battlefield 4’s campaign, and the one that opens this sequence looks like a simple matter of dodge-the-explosion. But no matter: that gives us more time to appreciate the Californian coastal countryside, lovingly captured by locals Sledgehammer. We’re forcibly pedestrianised soon afterwards, though, and get a solid stretch of exosuit-enabled antics. Protagonist Mitchell exploits the game’s customisable grenades to take care of terrorists with their own double-jump capabilities – making good use of a quiet grenade launcher and a scanner that reveals enemy positions. There doesn’t appear to be a great deal of choice in approach – but Sledgehammer skip a good portion of the level to let a Titanic-aping cutscene unfold at length. Hopefully there’s more of that verticality the exosuit allows. Did you see any of the Call of Duty: Advanced Warfare multiplayer reveal a day earlier? Can you say Titanfallatio?